The initials after a Realtor’s name indicate designations the professional has earned? Just one in 20 REALTORS® has the experience, the commitment and the advanced training necessary to call themselves a Certified Residential Specialist. But despite that added expertise, a Certified Residential Specialist doesn’t cost more than any other Realtor. In fact, the additional know-how you tap into may actually save you time and money when buying a home, or help increase your profits when you’re selling one. ETHICS – every CRS is required to maintain membership in the National Association of Realtors (NAR) and to abide by its strict Code of Ethics. FOCUS ON HOME BUYING & SELLING – to help make your home buying and selling more rewarding, every CRS must have a proven track record in the business, as well as advanced education in related areas like finance, technology and marketing. TECHNOLOGICAL EXPERTISE – the training available to CRS Realtors includes a strong focus on technology and its applications in the real estate business. ABILITY TO MAXIMIZE PROFITS/MINIMIZE COSTS – every CRS designee is trained to help you understand your local market, screen prospective buyers and sellers, negotiate in your best interest and, ultimately, help you enjoy a successful home purchase or sale. 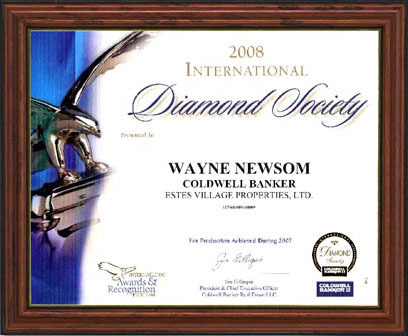 Just another reason to choose Wayne Newsom as your Realtor!